It could be said that extraordinary women are having a bit of a moment in pop culture. Supergirl is going strong in her first season on CBS. Jessica Jones is one of the most popular shows on Netflix. Once Upon a Time has been supplying us with strong female characters from fairytales and myth since 2011, including an Arthurian legend storyline in the current season. In 2017 we will see the long-awaited Wonder Woman movie hit theatres. And on January 1, my debut novel, Daughter of Destiny was published. 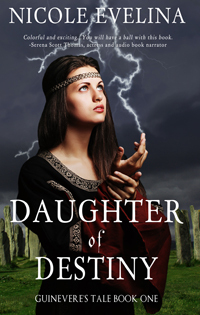 It's the first book in an Arthurian legend historical fantasy trilogy which tells Guinevere's life story from her point of view, beginning at age 11 and continuing into her 50s. Unlike previous iterations of the tale, she is not the fading wallflower of medieval courtly legend. This fifth-century Guinevere brings the powers of a priestess and the training of a warrior to her role, not to mention uncommon intelligence, wit and strength. I'm certainly not the first author to tell the story of Guinevere. Persia Woolley, Nancy McKenzie, Rosalind Miles and Sharan Newman are but a few who have taken on her story in the last 20 years. But each one of us tells Guinevere's story differently, with a different purpose and different filter as we come to a universal tale with unique life experiences, cultural pressures and viewpoints. We are all products of our own generation and time. While being careful not to stray too far from history (lucky for me, the Celts are known for their strong women), I offer my series as a 21st century woman's interpretation of the timeless legend. It's time for her name to be restored - Like Mary Magdalene and countless other women before her, Guinevere has been misrepresented by history. Most retellings remember only her sin, her affair with Lancelot, not the woman, the circumstances and the life surrounding it. Guilty or not, there is always a story around a moment in time and Guinevere deserves the same in-depth context and examination afforded her male counterparts. As she says in the opening of my book, "I deserve to be able to bear witness before being condemned by men who never saw my face...All I ask is that mankind listen to my words, and then judge me on their merit." The world needs strong female characters - Guinevere, despite her sullied reputation, is an archetype women of every age can look up to. A few years ago, Merida in Brave showed us that Disney princesses can be strong and accomplish a mission without a man at the end to bring about her happily ever after. Legendary ones can do the same. If King Arthur existed, Guinevere would have lived in a similar culture to Merida, in a time and place when women had more rights than in the rest of the world. Even 1,500 years later, Guinevere shows us that as women, while we naturally love and nurture, we can also lead ourselves and others, taking our destinies into our own hands and shaping our own future while positively influencing others. She is a perfect example of how strong is more than just physical strength - Yes, my Guinevere can wield a sword and leads troops into battle, but that's not the only way in which she shows strength. Over the course of the trilogy, my Guinevere is a woman who is tapped for roles she never expected - much less desired - and deals with repeated heartache, the loss of loved ones, jealousy, abuse, and expectations that would bow lesser women. She shows us that being a strong woman means carrying on even in your darkest hours and emerging on the other side stronger than you were before. It is a bold statement for me as a debut author to say that I hope my books do for Guinevere what The Mists of Avalon did for Morgan, but that is my goal. In addition to entertaining my readers, I hope to rehabilitate the reputation of a fallen queen and show that she deserves to be as honored and revered in own right as much as The Once and Future King she married.